Here we go with the final Hoop Nation of 2016! As the calendar year draws to a close, our man Logan Crosland takes a look at the NCAA happenings on the court. All team rankings from 12/12 D1 Men’s Basketball Poll. UCLA Upsets Kentucky: When you hear UCLA and Kentucky are matching up, it’s automatic excitement, due to the historic success of both programs. It was given even more intrigue as both teams are in the Top 25. The No. 2 Bruins went into Rupp ten days ago and defeated the Wildcats 97-92 (12/3). This is a huge upset for the Bruins and proves they may very well be a national title contender. For the No. 6 WildCats, it proves they are vulnerable and can be beaten if you can match up with them physically. West Virginia Tops Virginia: In a matchup of two of the best defenses in the country, points were going to be hard to come by the in the matchup between No. 12 West Virginia and No. 13 Virginia (12/3). Virginia came into the game with the top defense in the nation, while West Virginia came in ranked fourth in points allowed per game. The Mountaineers made a three-pointer with a minute-and-a-half left, and held on for the victory, which snapped the Cavs’ 24-game home winning streak. 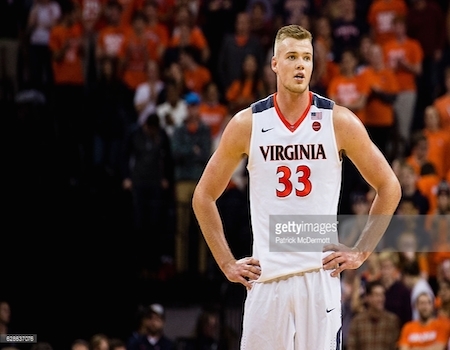 Jack Salt and the Cavaliers are 8-1 as of the latest poll (12/12). Indiana Bests Tar Heels: The No. 9 Hoosiers and No. 7 North Carolina was another recent match that presented a big game on a national stage. This game was a part of the annual ACC/Big Ten Challenge and probably had the most hype of any of those games. Indiana was able to get North Carolina into early foul trouble and take advantage to come away with an impressive 76-67 victory (11/30). Louisville Holds Off Purdue: Another game in the ACC/Big Ten Challenge saw No. 11 Louisville take on No. 15 Purdue (11/30). The Cardinals were able to dominate from the inside, outscoring the Boilermakers 32-18 in the paint, while out-rebounding them 36-34. Purdue put on a fierce rally in the second half, but Louisville was able to come away with the win, 71-64. Tough Times for Florida: Florida was given a big opportunity against two very good ACC teams, in the form of Duke and Florida State. First came the game against No. 5 Duke (12/6) in the Jimmy V Classic in Madison Square Garden. Florida was able to hang around with the Blue Devils for most of the game, but fell short ultimately, as Duke won 84-74. Florida then had to travel to Tallahassee to take on in-state rival FSU (12/11). No. 23 Florida State was able to get a great game out of their star player, Dwayne Bacon, and the Seminoles came away with a 83-78 victory. This Gators’ team is tough, so they will be able to recover from what was a rough week. 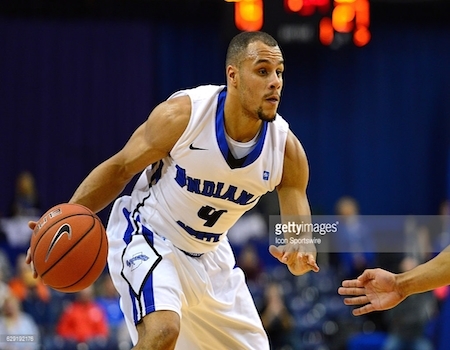 Brenton Scott helped Indiana State pick up a big upset over Butler. Indiana State Upsets Butler: Brenton Scott of Indiana State is the twin brother of Fort Wayne star player Bryson Scott, who led his team to an upset of Indiana just a couple of weeks ago. Needless to say, Brenton wanted to put his name in the history books with his brother. No. 18 Butler came into Terre Haute at 8-0 and looked to continue its undefeated season. Scott was able to get the better of the Bulldogs in a huge upset victory (12/7), sinking two late free throws to give his team a 72-71 win. Ironically, the Sycamores pull off this huge upset on the birthday of the school’s most notable alumni, Larry Bird. Syracuse and UConn Rekindle an Old Rivalry: Syracuse and Connecticut has been a defining NCAA rivalry over the years. Whenever these two former Big East foes have met up, whether it was in the Big East tournament or even the NCAA Tournament, it was always a big deal. However, we don’t get to see the matchup quite as often now, due to the fact that they are in different conferences. To make it even better, this year’s meeting was at the place of many of their classic game in the past: Madison Square Garden. Both teams have struggled much more than they were supposed to in this early part of the season, so this didn’t quite have the excitement as previous meetings. UConn got a couple of late free throws to pull out a 52-50 victory (12/5). No. 1 Villanova Escapes No. 21 Notre Dame: We go from one old Big East showdown to another. Nova-Notre Dame doesn’t quite have the caché that Syracuse-UConn does, but the games always have quality. Both teams came into this one unbeaten (12/12), so no extra hype was needed. Notre Dame actually dominated the Number One team in the country for most of the game, being up eleven at one point. 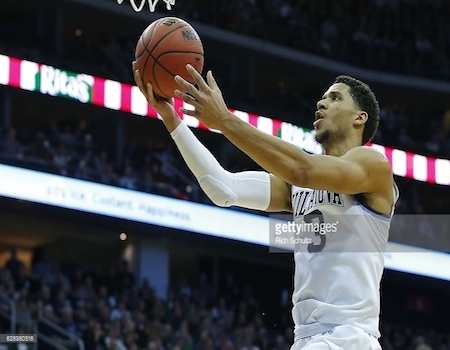 Villanova was able to overcome this deficit behind 37 points from senior point guard Josh Hart. Villanova will remain No. 1, but teams in the ACC need to watch out for Notre Dame. Josh Hart’s 37 points helped No. 1 Nova stave off Notre Dame. Iowa State Hits the Skids: Iowa State has been one of the more consistent programs in college basketball in recent history. These last two weeks haven’t been kind to the Cyclones, however. First they welcomed No. 25 Cincinnati into Hilton Coliseum (12/1), and lost a heartbreaker to the Bearcats in overtime, 55-54. They followed that loss up with a home victory over Omaha, before heading to Iowa City to face in-state rival Iowa. Peter Jok was able to lead the Hawkeyes to a 78-64 victory over the Cyclones, handing them their third defeat in four games. Q is Back: During our last visit to Hoop Nation, I had said that Quinndary Weatherspoon of Mississippi State would miss the rest of the year due to a wrist injury. Quinndary told coaches that he could play through it, due to the fact that the injury is to his non-shooting hand. He and Coach Ben Howland came together and decided that Quinndary would wait till after the season to have surgery. His return to the court has been huge, as the Bulldogs have won both of their games since his return in convincing fashion: 74-57 over Oregon State (12/1) and 82-60 over Georgia State (12/4).